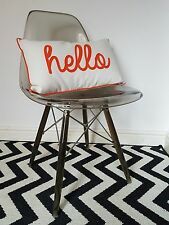 Vintage 1950's Style Basket chair. Excellent condition. Whoever bid for it the other day can you do so again I forgot to accept it!! NEW Mid Century Style Retro Clear Plastic Moulded Chair. Made from plastic, invitingly curved seat combined with contrastive wooden skates allow comfortable sitting and a gentle sway. Type: Rocking Chair. Rocking Function. 1 x Rocking Chair. Modern Light Blue Rocker Chair. Made from plastic, invitingly curved seat combined with contrastive wooden skates allow comfortable sitting and a gentle sway. Type: Rocking Chair. Rocking Function. 1 x Rocking Chair. Modern Red Rocker Chair. Cowhide pattern. Stylish Dining Chair. Raja Mango Dark. About Indiwood Furniture. Ajak Mango Dark. Wide, comfortable seat. Seat height: 46 cm. Raja Mango Light. Made from plastic, invitingly curved seat combined with contrastive wooden skates allow comfortable sitting and a gentle sway. 1 x Armchair. Type: Rocking Chair. Rocking Function. Rattan furniture, outdoor, lounger, wicker, sun lounger, patio. It's comfortable and classy with a design that fits equally in kitchen, living, working or dining room interior. Because of its stylish appearance, this elegant chair looks perfectly in bars, cafes and restaurants. Made from plastic, invitingly curved seat combined with contrastive wooden skates allow comfortable sitting and a gentle sway. Type: Rocking Chair. Rocking Function. 1 x Rocking Chair. Modern Green Rocker Chair. Made from plastic, invitingly curved seat combined with contrastive wooden skates allow comfortable sitting and a gentle sway. Type: Rocking Chair. Rocking Function. 1 x Rocking Chair. Modern Blue Rocker Chair. This stable and attractive chair is not only preciuos and trendy, but it`s unique and well designed too. LED lighting. - Elegant design. Product details Width: approx. Height: approx. This stable and attractive chair is not only precious and trendy, but it`s unique and well designed too. - Elegant design. Product details Depth: approx. Width: approx. Height: approx. Material Beech, Polypropylene. DSW Style Chair - Coral. It is best to be used in dining rooms, kitchens, bedrooms, offices, cafes and restaurants. This DSW Style Chair is the perfect combination of comfort and original style. This chair crafted from polycarbonate coloured in white is a real stunner. Colour White. It is not only lightweight and easy to clean but also utterly comfortable. Material Plastic. We go above and beyond to ensure you receive the best level of service. Material Beech, Polypropylene. It is best to be used in dining rooms, kitchens, bedrooms, offices, cafes and restaurants. DSW Style Chair - Baby Pink. This DSW Style Chair is the perfect combination of comfort and original style. Pink Accent Chair. Seat of ribbed plastic, solid wood legs. Looking to buy more than 1?. No problem! We go above and beyond to ensure you receive the best level of service. Material Beech, Polypropylene. It is best to be used in dining rooms, kitchens, bedrooms, offices, cafes and restaurants. DSW Style Chair - Teal. This DSW Style Chair is the perfect combination of comfort and original style. Retro Style Chair. Light pink accent chair. Colour Pink. With anti-scratch pads on the feet to protect the floor. Looking to buy more than 1?. No problem! Easy to clean. We go above and beyond to ensure you receive the best level of service. The dining room chair impresses with its clear lines and brings such a straightforward highlight in your rooms. An upholstered Chair, should not be missing on your dining table! We have staff and we have leisure. Material Beech, Polypropylene. It is best to be used in dining rooms, kitchens, bedrooms, offices, cafes and restaurants. This DSW Style Chair is the perfect combination of comfort and original style.